Salthouse Harbour Hotel01473 226789work Townhouse HotelThis artfully designed boutique hotel and restaurant dazzles in the waterfront of Ipswich’s vibrant Harbour quayside. The Salthouse Harbour Hotel goes beyond what you expect and exudes its 4 star status in every curious corner, eccentric sofa and unstuffy cushion. The sea-salted brickwork exterior has been restored and rejuvenated into a ship shape contemporary warehouse of rich modern interiors and rooms adorned with vintage furniture, sculptures and eclectic art. 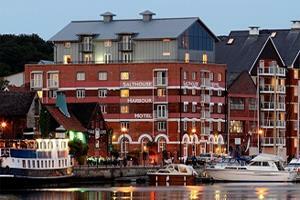 This artfully designed boutique hotel and restaurant dazzles in the waterfront of Ipswich’s vibrant Harbour quayside. The Salthouse Harbour Hotel goes beyond what you expect and exudes its 4 star status in every curious corner, eccentric sofa and unstuffy cushion. The sea-salted brickwork exterior has been restored and rejuvenated into a ship shape contemporary warehouse of rich modern interiors and rooms adorned with vintage furniture, sculptures and eclectic art.